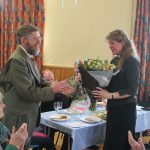 Robert Wilson’s letter to Emma read out at her leaving lunch in the village hall on Sunday 3rd February 2019. Warm welcome to everyone here from the PCC who have organised this beautiful event. 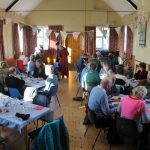 Before we approach the real focus of our celebration, I want just to thank Jean and Waveney and Marion and Lynda and Susan and all the people who have cooked and worked and organised to create our super lunch and also to say that we would appreciate any donations towards the cost of the event and that there is a box near the door. 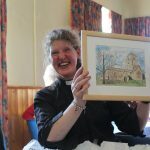 Dear Emma, We the parishioners of Cuddesdon and Denton (all of us) thank you from our hearts for being our vicar for the last ten years. We thank you, dear Emma…For visiting us and ministering to our needs, for making arrangements for weddings and baptisms and funerals. We thank you for the care and sympathy and understanding, for the sensitivity that you have shown on these occasions so that we knew that you were relating to us individually and sharing in our personal and family experience and not just carrying out a duty. Thank you, dear Emma, for your care and compassion when we have been ill or in need of particular support or counselling. Thank you for listening to us and for sharing your wisdom and insights and thank you for being such an example to us for you have suffered pain and distress and you kept going courageously. 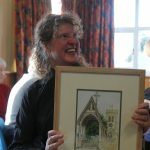 Thank you too Emma for the many occasions that you have helped with the more public events in our village, for your presence at coffee mornings, your help at the fete, your memorable contribution to Cuddesdon Conversations on Dame Julian of Norwich and so much else. Thank you for sharing our concerns as a community. Thank you Emma for your prayers and for your spiritual guidance and support. We, your congregation at All Saints, have so much appreciated your many accomplished, helpful and humane sermons and we have appreciated the gifts of contemplation and silence that you have shared with us…We thank you for your warm engagement with children when they have been present in the church, for your inviting them to come close around the altar when you are consecrating the sacrament, for your interest and ability to draw them into sharing their art works with the congregation. We thank you for initiating the Messy Church and we also thank you for something for the other end of the age range, the series of lectures you organised on the church fathers relating to our reredos behind the high altar and followed by compline in our beautifully restored chancel. Dear Emma, We, the members of the PCC, thank you so much for your leadership, for the many ways that you have directed our meetings towards positive outcomes, for your clear insight and for your help in the keeping of our thoughts and feelings appropriate to our roles. Thank you for the harmony of our deliberations and thank you for supporting us in complex and extensive restoration projects, without insisting on your views but allowing us to carry through what we felt was needed to be done. 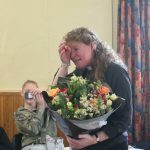 Dear Emma, … the thank yous continue… thank you for bringing our benefice together so that we have been able to enjoy more closely our relationship through you with St Giles’s, Horspath and St Mary’s Garsington. At the same time, thank you for being sensitive to our particular identity in Cuddesdon and to our historic relationship with the college and to its regular use of our church. And so, life is full of changes and Emma is now called to a wonderful new job that seems to have been designed with her in mind and she carries with her, our gratitude for her spending ten years with us, and our love and our prayers for all the goodness that she will do and experience in her new role as Canon Missioner at Canterbury Cathedral. 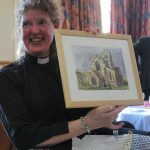 Emma, when I asked what present you would like, you rather scorned a John Lewis Token and said you would like a picture of the church and we have here the work of two artists, one from within the worshipping community and one from the wider community, Rosie and Nicko. Do tear off the wrappings so that we can all admire them. And there is additionally some money to come to you, which maybe you will want to spend on Jonathan, Katie and Thomas. And here is a lovely card by Rosie which you have seen us all sign and if there is anyone here who has not yet signed and left a message for Emma, please do so.